then plays solitaire while Gotham burns. You know he's bad because only someone with evil in their heart would enjoy solitaire...I hate solitaire! I like this Riddler. He isn't just a joke and while I love the Batman '66 version, I think he is still looked at as goofy all these years later. I know there are other versions since, but I haven't been reading comics almost all my life like a certain reviewer for this site. Edward Nygma has gotten a push recently in the Batman Zero Year story. 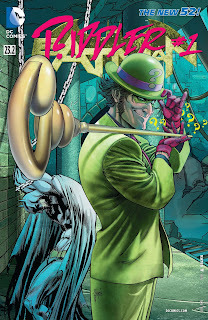 Scott Snyder has shown just enough to raise my curiosity of who this Riddler really is. Batman #23.2 is not an origin story and it's not a Zero Year tie-in per se, but an awesome one shot that shows what the New 52 Riddler is all about. I think I like it because it ties into the regular run of Batman going on right now, even if it threw me off a bit since I am kind of in the Villain's Month swing of things. Writer Ray Fawkes (with story by him and Scott Snyder) really hits the mark here. Everything fits so perfectly into the Bat Universe. The Riddler is so cool. He is the smartest guy in the room and he knows it. Yes, he is a sadistic SOB who has personal space issues, but he is still so likable. I can't wait for more of him in Zero Year. I also want to see more of Ray Fawkes. I am already a fan of Jeremy Haun after this issue. Everything looks so good here and the art is a great compliment to the story going on. 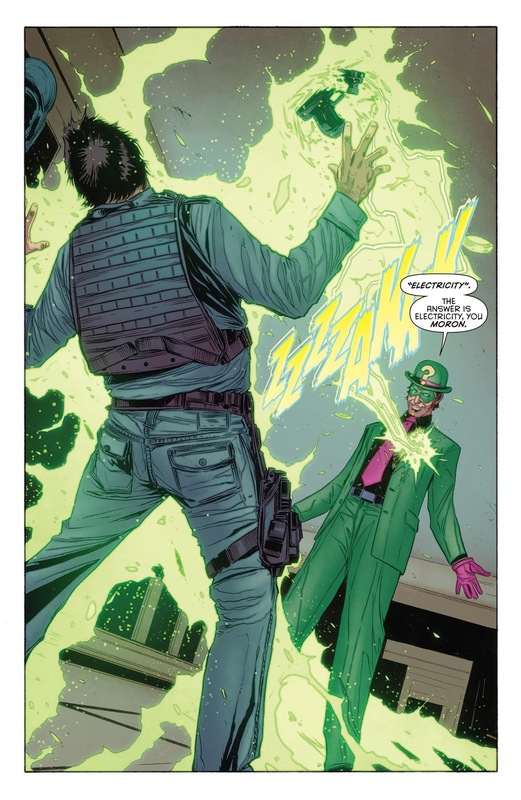 I'm not sure if everyone will go for this look of the Riddler, but Haun keeps it accurate to the Capullo version going on right now and I really like it...a lot! If we could get a Fawkes/Haun book right now, I'd be a happy man. Batman #23.2 is a great issue. Ray Fawkes fleshes out the Riddler and I love him. Everyone should read this and being a one shot, everyone can fully enjoy it. 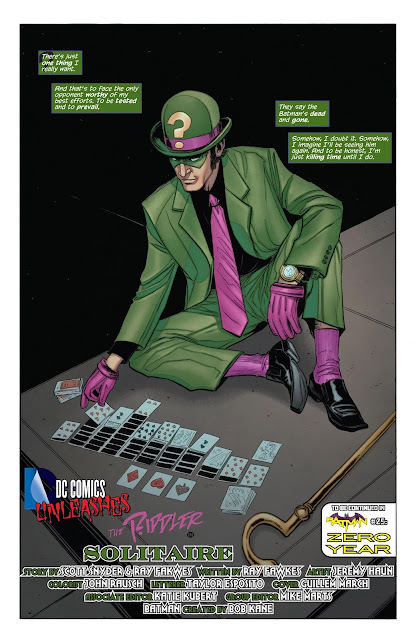 Just remember, the Riddler likes his cards and never, I mean never, touch him. I thought there were very few really good comics in the Villains month. That didn't stop me from buying all of them though. This was one of the better ones, if not one of the highlights. i agree...I got every one of them and some were stinkers. I still miss the big September Events !